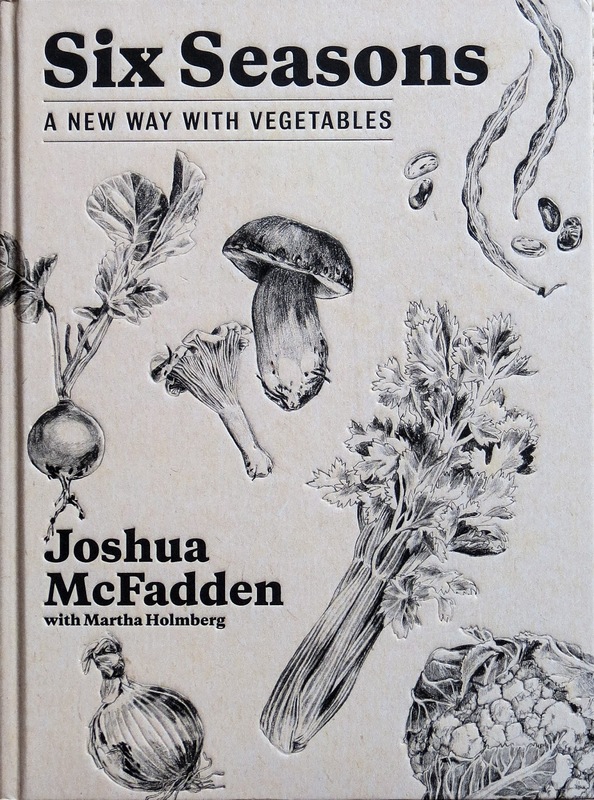 Niece Slone arrived at the boat weighted down with Portland Chef Joshua McFadden's amazing new cookbook, Six Seasons: a new way with vegetables. This treasure presents nearly 400 pages of interesting commentary and appealing recipes for vegetables raw and vegetables cooked; a chapter of go-to recipes for tasty sauces and accompaniments to enhance fresh vegetables; a scattering of tempting recipes that incorporate meat, sausage and/or seafood; plus an occasional dessert. All of that and photos for most dishes. 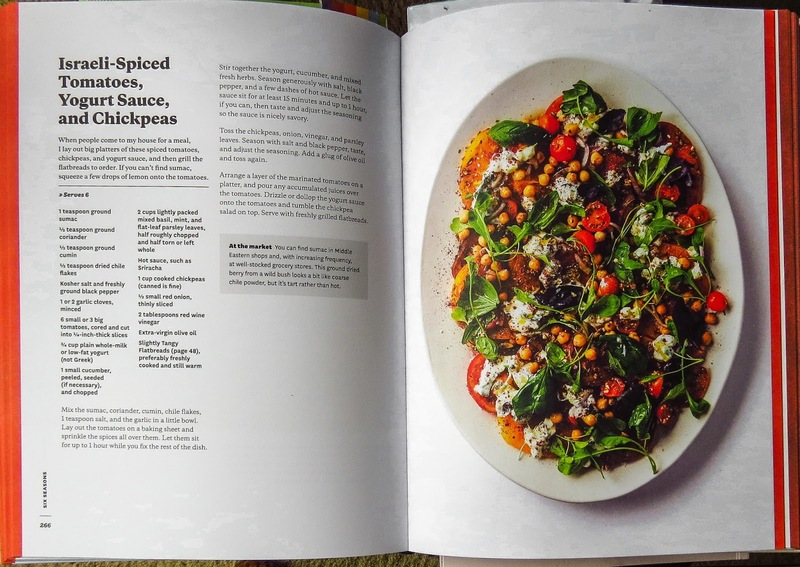 Co-author Martha Holmberg adds considerable talent and experience to this cookbook. An award-winning food writer and editor, former publisher and editor of Fine Cooking magazine and most recently food editor of the Oregonian newspaper, her guidance is felt throughout. I would love to hear this team share the back story of creating this book. The six seasons title reference acknowledges the overlap and variability of our Pacific Northwest growing seasons. McFadden notes "summer is where the action is", emphasizing different vegetables for early summer, midsummer and late summer. I flipped through the Late Summer chapter, waiting to see which photo drew my tastebuds' attention. Oh my, how to choose between sweet corn, peppers, chiles, tomatoes and more?! Ingredient availability made the decision an easy one. I went with a modified, ship's galley version of McFadden's 'Israeli-Spiced Tomatoes, Yogurt Sauce, and Chickpeas.' Six just-picked, garden-fresh cucumbers sat on the countertop, recently shared by a dock neighbor. Local markets offered mounds of fresh, in-season tomatoes and herbs, and my pantry held za'atar. Olive oil and vinegar substituted for the yogurt sauce, changing the flavor blend and consistency somewhat. A topping of feta cheese added to our second servings restored the savory edge quite nicely. I'll use yogurt and feta next time. The Seattle Times included the same recipe in their review of Six Seasons; "A menu for all seasons - and then some." Obviously, a popular choice. We agree! Thank you, Slone, for the inspiration. Optional: crumbled feta cheese to sprinkle on top. 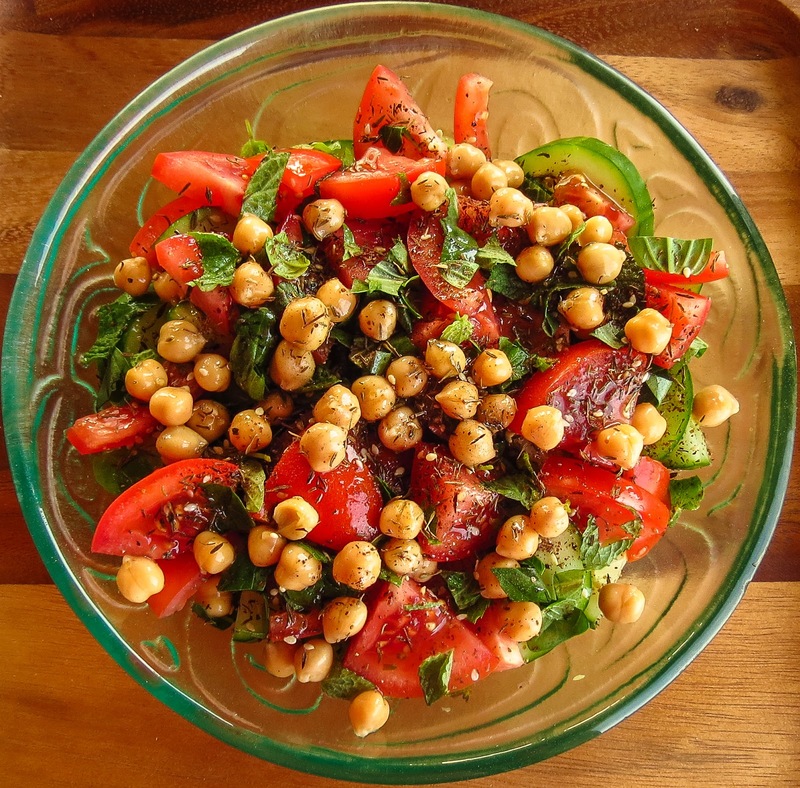 Place the tomatoes in a wide, flat-bottomed bowl. 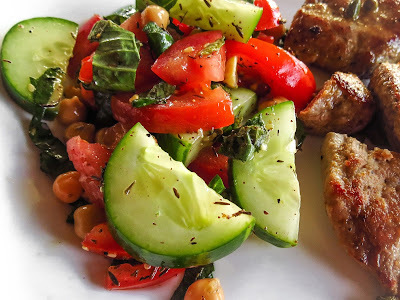 Add the remaining 4 ingredients, toss to coat, and let sit at room temperature while preparing the cukes and chickpeas. In another bowl, add the cucumbers, fresh herbs, yogurt, salt and pepper. Toss gently together, taste and adjust seasoning. Let sit at room temperature while you prepare the chickpeas. In a third bowl, add the chickpeas and remaining ingredients. Toss, taste, and adjust seasoning. Spread the tomatoes and their juices on a serving platter; layer the cucumbers plus any juices over the tomatoes; scatter the chickpeas and their dressing evenly over all. Sprinkle feta, if desired, over the top and serve. OR toss and serve in individual bowls. McFadden suggests serving with warm "Slightly Tangy Flatbreads" - sounds good to me!